We quickly located a waitress and once she had confirmed for us they had high chairs, we made ourselves comfortable on an outside table beneath an umbrella. It was Melbourne Cup day, and we were looking for a nice place to lunch. The main criteria in making our choice was the requirement of ample space (many eateries we’d walked by were packed), the aforementioned high chair, and an interesting looking place. The addition of bonus booze sealed the lunchtime deal at Grey & Bliss. It was warm yet windy, but still the lack of sunny stillness didn’t keep the people away from Port Melbourne that Tuesday. Baby girl was given a very cute high chair, and we quickly made our orders (we were hungry). and accompanied by a glass of bubbly of course. The presentation of the meals was stunning. We were hungry, and seeing such huge, visually-pleasing meals in front of us was very satisfying. 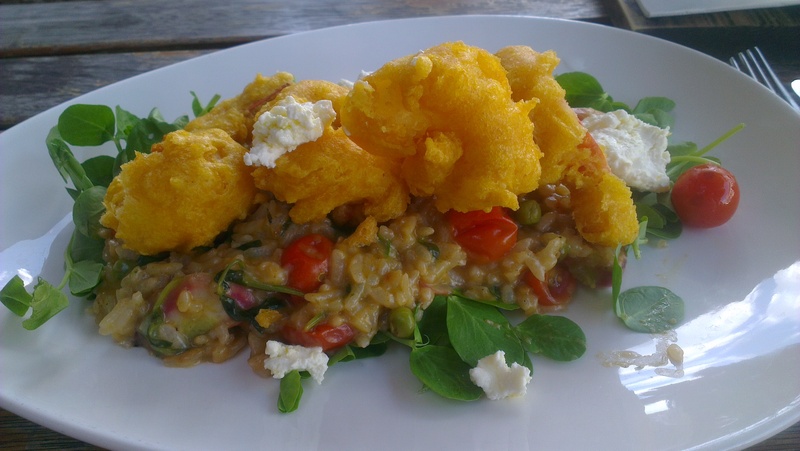 My risotto had a decent kick to it, leaving me with a spicyness at the back of my throat, and overall it was creamy and rich, filled with radishes, spinach and cherry tomatoes. I loved the tempura prawns on top. My confusion came with the term ‘lobster bisque.’ I was expecting some form of lobster, and couldn’t see or taste any in my risotto. I later googled the term ‘lobster bisque’ to properly understand what it was I had been eating, to learn that bisque is a highly seasoned soup strained from crustaceans. I found a few recipes that mention using the broth of the lobster, but the end result always seems to be adding the ‘meat’ of the lobster back into the dish. Unless it totally dissolved into my risotto, I couldn’t find it. Still, my risotto had a different yet great taste which I will attest to the bisque. Would have loved some meat, but we’ll just leave that discussion there. Hubbie’s meal looked great, and apparently was just as great taste-wise. He left most of the healthy-looking bread behind only because he was struggling to finish his chips and was opting for them rather than the bread. I don’t blame him. 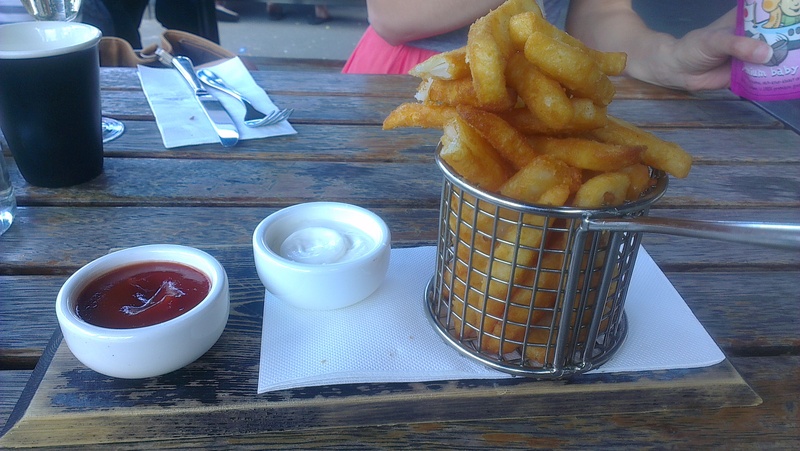 The chips were so yummy, and accompanied by tomato sauce and aioli – oh my gosh that aioli was the bomb. I could have eaten it out of a jar. His meal also came with a spicy/herby dip, that was also very good. All these rich foods left us feeling really, really full for a long time afterwards (maybe the hidden lobster meat filled me up more than I realised 😉 ). The meals were great to eat, and great to look at… and we would definitely go back. But we were soooo full. Maybe not so much creamy food for me next time. Food: 9/10. What I loved about the simple menu was that it was a little different, offering up interesting menu options while still appealing to the palate that shies away from overly adventurous food. Visually appealing, generous, and very yum. Coffee: Not this time folks… spewing because I noticed some really rave reviews on Urbanspoon regarding their coffee… but I just couldn’t stomach it after all that food. Ambience: Relaxed, as we were on Bay Street, and I didn’t get a good look at the interior but from what I could see it looked edgy and cool. I liked how one ‘apparent’ entry/exit point was blocked off by positioning a small table in front of it which a couple were dining on. Imagine people eating in the middle of a narrow doorway. Different. Staff: Also relaxed, and friendly. At first I wasn’t too sure about one of the guys who came to take our order. But upon returning with our hot jug of water for baby girl’s food (it came ASAP as requested) he struck up a bit of a convo about kids and the dangers of boiling water. Scary thought. We were also served by another waitress who was lovely and accommodating. People: Bit of a mix – I saw an old man drinking coffee inside by the window, another middle-aged couple, a few younger people stopped by at the end of our meal who sounded like they were on a blind date, and friends meeting up. Price: $49-ish, which also included Hubbie’s beer. I was happy with that, given the quality and amount of food on offer, as well as the fact we got free champagne for both our meals – WINNING! Advice: If you love your coffee like me, easy on the rich meals, just so you can actually fit the caffeine into your system. 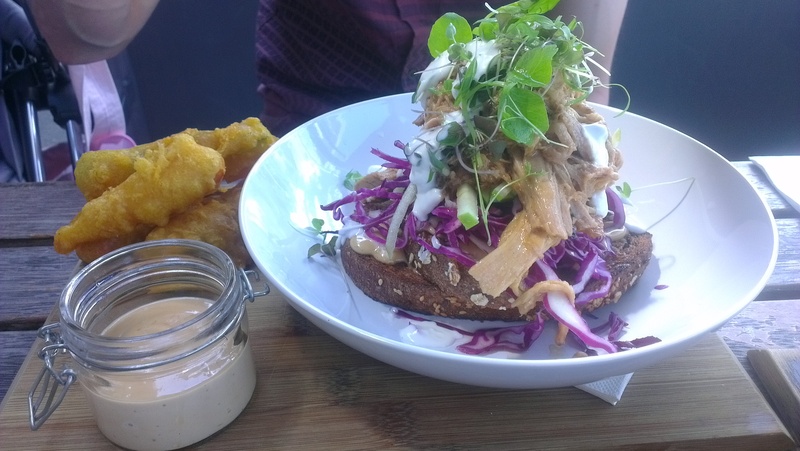 In a nutshell: A great place that stands up against the other fantastic Bay Street/Port Melbourne eateries. This is a terrific ‘go to’ when you find that other more known places are packed, as there appears to be plenty of room inside. Oh what the hell… go there even if the others are quiet. A man is seen crossing the road in a hurry, avoiding oncoming traffic, with two coffees in his hand. He comes to a car parked alongside the road: there waiting is his partner. He hands her a coffee, and they both run into their car with the most determined conviction. There are a couple after my heart. No day or list of jobs is ready to be undertaken without a coffee firmly in hand. 8am, a man is spotted with a pram, waiting at an intersection to cross the road, with a tray of 4 coffees in one hand. 8am. One hand pushing pram, the other holding a tray of coffees. For a sitcom situation to occur, all that baby in the pram has to do is start crying. That is all. A woman crosses Bay street pushing a pram, groceries in the undercarriage compartment, a baby strapped to her chest, with a coffee in one hand. Multi-tasking at its best. Determination to go home with coffee at its finest.